How did it all come about? Well, remember that the founder of the Chrysler Corporation, Walter P. Chrysler, got his start aworkin’ on the railroad. 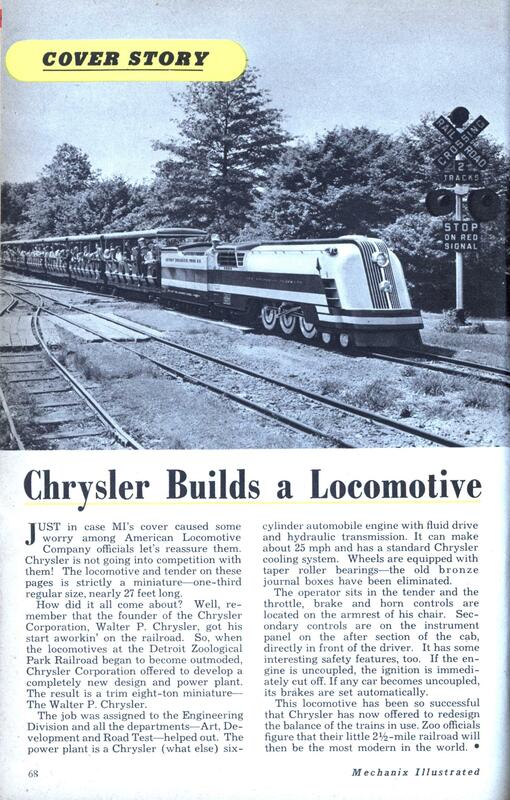 So, when the locomotives at the Detroit Zoological Park Railroad began to become outmoded, Chrysler Corporation offered to develop a completely new design and power plant. The result is a trim eight-ton miniature— The Walter P. Chrysler. The job was assigned to the Engineering Division and all the departments—Art, Development and Road Test—helped out. The power plant is a Chrysler (what else) six- cylinder automobile engine with fluid drive and hydraulic transmission. It can make about 25 mph and has a standard Chrysler cooling system. Wheels are equipped with taper roller bearings—the old bronze journal boxes have been eliminated. The operator sits in the tender and the throttle, brake and horn controls are located on the armrest of his chair. Secondary controls are on the instrument panel on the after section of the cab, directly in front of the driver. It has some interesting safety features, too. If the engine is uncoupled, the ignition is immediately cut off. If any car becomes uncoupled, its brakes are set automatically. I had a really old stove/oven that was built by GM. They don’t look so pretty, but I’ve seen Peterbilts modified for track usage, hauling freight along disused lines of the DAR. Today’s train consists of two complete trains of six coaches each and one standby. 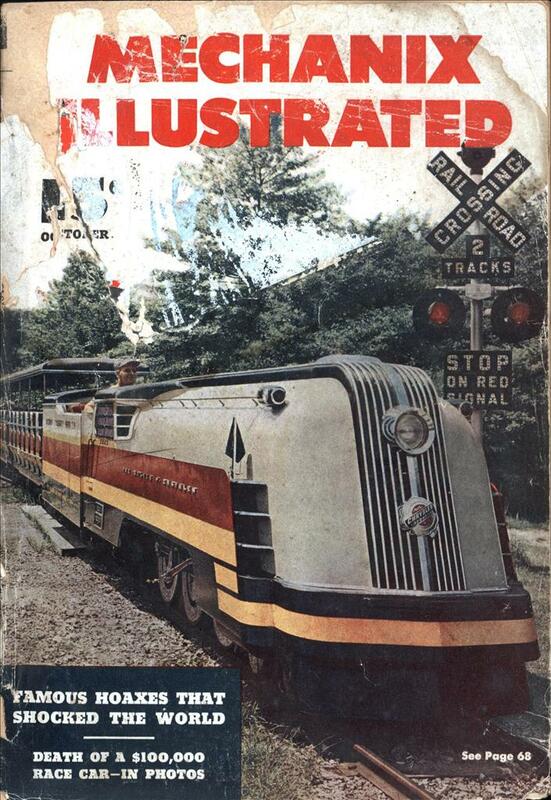 All three locomotives were donated by the Chrysler Corp. in the 1950s.